An organization selling pets on Long Island is being investigated by New York's attorney general amid accusations it is selling sick and dying puppies that are unfit for purchase. 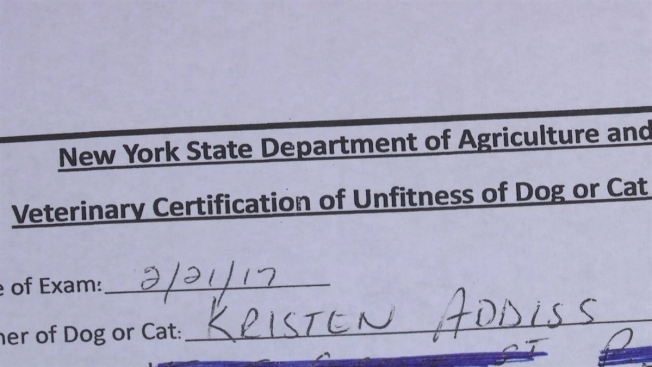 Long Island woman Kristen Addiss is one of a group of people to file a class action law suit against Friends of Freddie Pet Rescue after purchasing a puppy that was so sick it had to be put down, costing her and her boyfriend thousands in vet bills. The couple said they were over-the-moon to take new puppy Layla home from what they thought was a rescue shelter. But soon after, her breathing appeared to be failing, and she had a cough. Middle Island's Friends of Freddie Pet Rescue recommended a vet to the couple, they say. "She was really lethargic all day, wasn't drinking much or eating so we asked them to take a look at her that day," Addiss said. They were given antibiotics to fight kennel cough, but another vet later diagnosed Layla with canine distemper and pneumonia. The puppy died at 11 weeks old, and cost the couple $2,300 in vet bills. "The vet said she was unfit for purchase and she shouldn't have been adopted out," Addiss said. The couple contacted Friends of Freddie, which offered to refund the $473.80 adoption fee and give a new puppy, however they declined. An insurance claim was denied because the vet labeled the condition pre-existing. A New York State Lemon Law could have given the couple some legal relief from the expenses, but it only applies to pet dealers -- those who sell more than nine dogs a year at a profit -- not rescue shelters. New York's attorney general said he had received other similar complaints about the business, and was investigating. and she was really lethargic all day wasn't drinking much or eating so we asked them to take a look at her that day.